Scheffau is a village in the Lammertal Valley, a well-known skiing and hiking holiday destination. 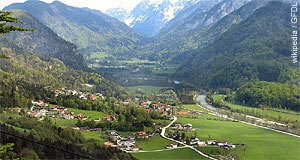 Scheffau is situated in the Tennengau region of Salzburg and has a population of approximately 1,300. Tourism is a big deal in Scheffau, but the local service sector in non-tourism related fields as well as agriculture are also important for the community′s economy. The Lammer, a river, runs through the village. The name Scheffau was first mentioned in 1249; this is very late, especially since the local church was the centre of a parish since the 10th century. This church, called Ulrichskirche, was also a popular church of pilgrimage. Until 1849, Scheffau was part of neighbouring Golling. Since then, it is an independent municipality. In terms of tourism, Scheffau targets mostly families. This is done out of necessity, as the Tennengau towns have a hard time competing with the top-notch skiing towns in the south of Salzburg. However, at least this way they manage to serve a niche and accommodate the specific needs of children. You will notice that almost every hotel in the Lammertal region will have some sort of offer aimed at families. For hiking, Scheffau offers direct access to some of the nicest corners in the Northern Calciferous Alps. Note the hiking routes through the Lammerklamm, a river gorge of the Lammer. Note also the "Scheffauer Mühlenrundweg", a circular path along which you will see several historic water mills. Scheffau also has two waterfalls to offer, namely the Winnerfall and the Schwarzbachfall.